Focusing on one of the most obvious nations where Christians are regularly targeted—Egypt's Coptic Christians—one finds that the "mob" is the most visible and obvious culprit. 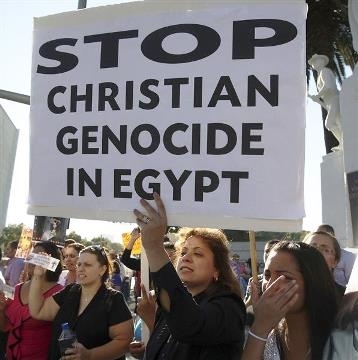 One Copt accused of some transgression against Muslim sensibilities—from having relations with a Muslim woman, to ruining a Muslim man's shirt—is often enough to prompt Muslim mobs to destroy entire Christian villages and their churches. Recently, for example, after her cross identified Mary Sameh George as a Christian, a pro-Muslim Brotherhood mob attacked, beat, and slaughtered her. Those who killed the young and vulnerable Mary Sameh George, for hanging a cross in her car, are not criminals, but rather wretches who follow those who legalized for them murder, lynching, dismemberment, and the stripping bare of young Christian girls—without every saying "kill." [Islamic cleric] Yassir Burhami and his colleagues who announce their hate for Christians throughout satellite channels and in mosques—claiming that hatred of Christians is synonymous with love for God—they are the true killers who need to be tried and prosecuted… The slayers of Mary Sameh are simply a wretched mob, with the body of a bull but the brain of a worm. It's not the puppets on the string who need punishing, but rather the mastermind who moves the puppets with his bloody fingers behind closed curtains that needs punishing. One fact certainly validates this Arabic op-ed's assertions: the overwhelming majority of attacks on Christians in Egypt and other Muslim nations—including the slaughter of Mary Sameh George—occur on Friday, the one day of the week that Muslims congregate in mosques for communal prayers and to hear sermons. The significance of this fact can easily be understood by analogy: what if Christians were especially and consistently violent to non-Christian minorities on Sunday—right after they got out of church? What would that say about what goes on in Christian churches? What does it say about what goes on in Muslim mosques? The Arabic op-ed also does well to name Sheikh Yassir al-Burhami as one of those who "announce their hate for Christians throughout the satellite channels and in mosques, claiming that hatred of Christians is synonymous with love for God." For example, Dr. Burhami—the face of Egypt's Salafi movement—once issued a fatwa, or Islamic edict, forbidding Muslim taxi- and bus-drivers from transporting Coptic Christian priests to their churches, which he depicted as "more forbidden than taking someone to a liquor bar." As for hating non-Muslim "infidels," many Islamic clerics, especially Salafis, believe that the doctrine of "Loyalty and Enmity" (or wala' wa bara') commands Muslims never to befriend or be loyal to non-Muslims. Burhami himself appears on video asserting that if a Muslim man marries a Christian or Jewish woman (known in Islamic parlance as "People of the Book")—even he must still hate his wife, because she is an infidel. Where's the objection? Do all men love their wives? How many married couples live together despite disagreements and problems? Huh? That being the case, he [Muslim husband] may love the way she [non-Muslim wife] looks, or love the way she raises the children, or love that she has money. This is why he's discouraged from marrying among the People of the Book—because she has no [real] religion. He is ordered to make her hate her religion while continuing marriage/sexual relations with her. This is a very standard matter…. Of course he should tell her that he hates her religion. He must show her that he hates her because of her religion, and because she is an infidel. But if possible, treat her well—perhaps that will cause her to convert to Islam. He should invite her to Islam and call her to Allah…. In fact, let me tell you: whoever rapes a woman, does he necessarily love her? Or is he just sleeping with her? He's sleeping with her for her body's sake only, and he does not love her in reality, because if he loved her, he wouldn't have hurt her. Therefore it is possible to have sexual relations [between a Muslim man and a Christian or Jewish woman] without love. This is possible, but as we said, he is commanded to hate her (emphasis added). Burhami even said that the Muslim husband cannot initiate greetings to his non-Muslim wife when he comes home—according to the teachings of Islam's prophet as recorded in the hadith. Otherwise what do you do with the undisputed texts [of the Koran], such as "Thou wilt not find any people who believe in Allah and the Last Day, loving those who resist [or reject submission to] Allah and His Messenger, even though they were their fathers or their sons, or their brothers, or their kindred… "O ye who believe! take not the Jews and the Christians for your friends and protectors…" [Koran 58:22 and 5:51, Yusuf Ali translation]. What do you do with such a verse? What do you do will all these verses? Indeed, what does a Muslim do with all these Koran verses and sayings attributed to Islam's prophet Muhammad? From here it becomes clear that the aforementioned Arabic op-ed discussing the slaughter of Mary Sameh George is only partially correct. It is true that behind the mindless mob stand Islamic clerics like Burhami, inciting hatred for Christians and other infidels. But that is not the complete picture; for behind all these clerics stand Islam's scriptures—the Koran and hadith—commanding enmity for the infidel. In short, it's not just a few "radical clerics"—a few "rotten apples"—that incite mobs to attack Christians, but rather the core texts of Islam itself.